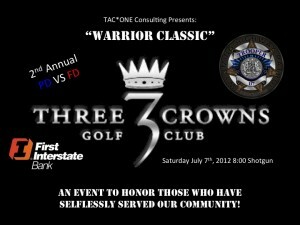 TAC*ONE Consulting is bringing the 2nd Annual PD vs FD “Warrior Classic” Golf Tournament to Casper’s Three Crowns Golf Club, Saturday July 7th, 2012 at 8:00 a.m.
Register through Three Crowns Golf Club HERE! Last years tournament proceeds went directly to two Wyoming public servants – Carbon County Deputy Lt. Kyle Rosentreter. Lt. Kyle Rosentreter was suffered a sever career ending injury on duty in July of 2010 while responding emergent to a call for service. Green River Fire Fighter Nathan Mandros had recently underwent a kidney transplant a few months prior to showing up and participating in last years tournament to raise money for his fellow brethren in blue. 2012’s proceeds will go directly to two local community hero’s Natrona County Fire Fighter Adam Longo’s and Converse County Sheriff’s Deputy Bryan Gross’s families. Bryan Gross lost his life while participating in a swit water rescue on the North Platte River July 28th,2011. Bryan courageously entered the water to assist a citizen who was attempting to save a 14 year old female who had fallen into the frigid river. Adam Longo suffered a life ending stroke while duty April 12th, 2012. Adam proudly served the Wyoming community as a peace officer while working for the Wyoming Highway Patrol before joining the Natrona County Fire Department. What better way to raise money for our own than playing 18 holes with your fellow first responders from around the state. The success of this event depends on the participation and involvement of all of us! Lets prove that the common ground that binds us all together on and off duty still exists in today’s public safety by losing a few balls for our brothers who proudly served their communities! Lets see if the knuckle draggers can keep up with the hose draggers whom have all the extra time to practice! Tourney will be formatted in PD vs FD foursomes to provide a friendly atmosphere for the “badges” to battle it out! You can also visit www.taconeconsulting.com for more information and a link to register. 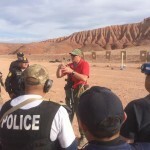 TAC*ONE Instructor Featured on COPS! 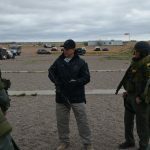 TAC*ONE Consulting offers active shooter response & tactical training for law enforcement and self defense concealment training for civilians. Website & SEO by Purple Mountain Digital Marketing, LLC.